I love Chaos stuff when it looks truly chaotic and insanity inducing, and there's no denying that this falls into that category. I'm not even sure what model this guy is based off of, but it's pretty awesome. The eyeless face is very creepy and really makes this guy feel like something not of this world. The pose is fairly dynamic, and when coupled with the crushed debris under its feet you get a real sense of it swooping down and landing hard. 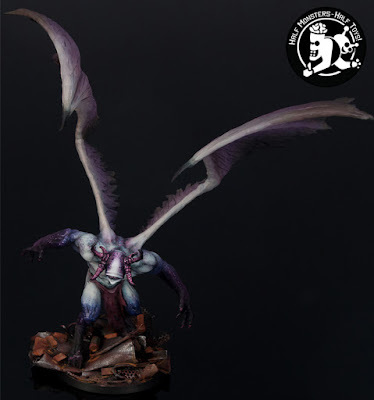 The pale skin tone blending into a mottled blue, pink, and purple does a good job at making this feel like a Slaanesh demon, along with the six horns. All of the painting is smooth, with nice crisp highlights while still maintaining a ton of subtlety. I think its this subtlety, especially with the mottled pattern on its skin, that really sells it. 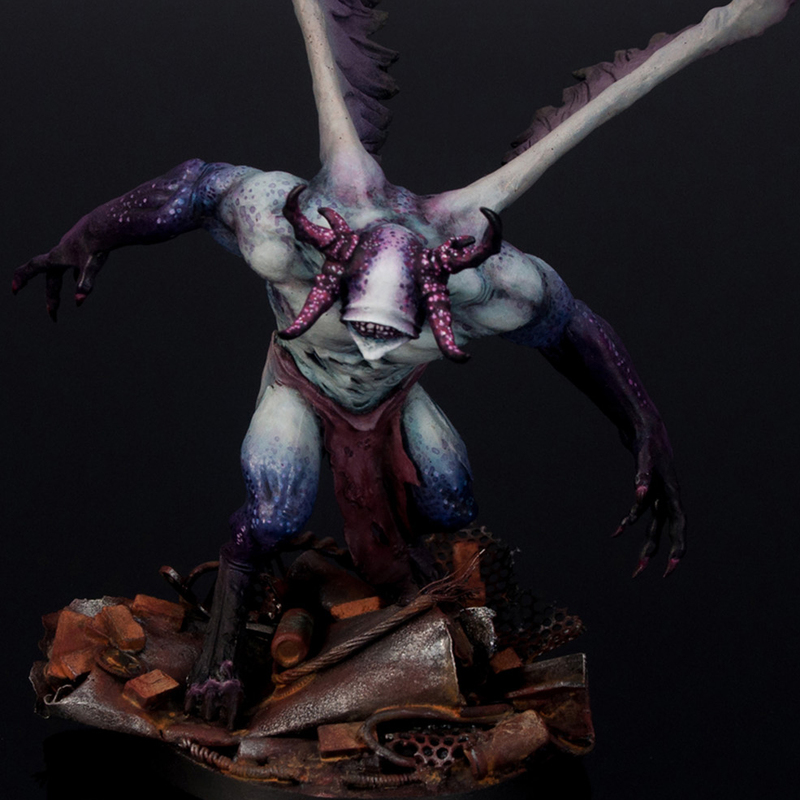 The only thing I think I would have liked to see more of would be more obvious connections to Slaanesh and Chaos. I don't mean anything perverse, just some icons or something. This is Warhammer after all, where are the skulls? At the moment this could easily be a demon from any fictional universe. Besides that small nitpick it's pretty stunning and creepy. Be sure to check out more views of the model on Cool Mini or Not and show the artist some love. I will be gone on vacation for the next two weeks, so while there will still be articles posting up here regularly, I won't be readily available to respond on here or Twitter and Facebook. Please comment and reach out to me on social media though, I'm sure I'll be able to check it every now and then and respond. Otherwise, see you all in two weeks!